Hi Chicky Babes /Blokes! ".......and ARE you are happy with your recently purchased items"??? Yep, Yep, Yep and Yep! All is well and thanks for the opportunity to "KickAss" if it was needed. NO PROBLEMS, Very Happy. Seems good quality and more orders soon as decided! 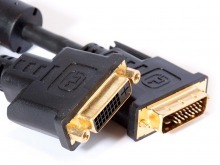 DVI-D Cable products for the best quality AV Accessories at the lowest prices every day! 5M DVI-D Male to DVI-D Female Extension Cable + FREE SHIPPING! Most Popular DVI Cable! In-Stock & Ready to Ship!